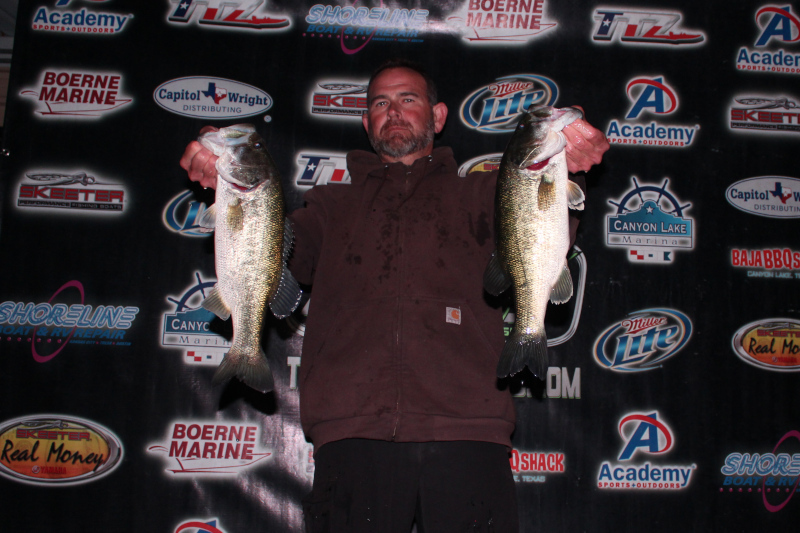 CANYON LAKE, TX – Fishing has improved from last week that resulted in a 1.57lb per fish average and and anglers earning a check with 5lbs, to this week in which we saw an increase in size to nearly 2 pounds and taking 8 ½ pounds to get a check. 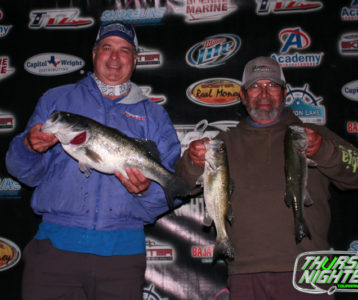 The cooler weather and a little wind may have helped anglers out, at least for this week as many fish were caught shallow, and it certainly played into Trey Groces game plan. 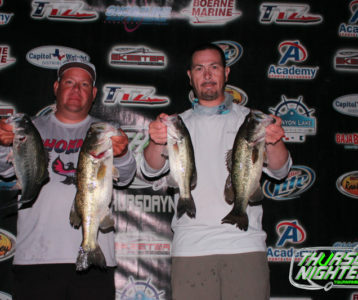 Trey said he had been urging his partner in recent weeks to go shallow as the deep water bite hadn’t been paying off, so tonight Trey said he did just that and stayed shallow all night. Trey was throwing moving baits around brush and covered shallow water until he came across some fish stacked up just before dark. 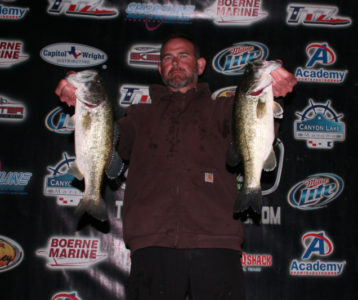 There he was able to fill out his limit for 11.81 pounds and the win. This is Trey’s first Thursday Nighter win of 2019 and his 2nd overall. 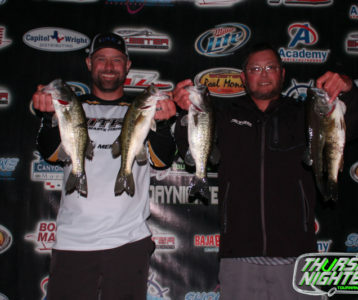 After a tough week last week, the hot team of Jason Olivio and Joey Rodriguez bounced back and brought in 10.21 pounds to take 2nd place. 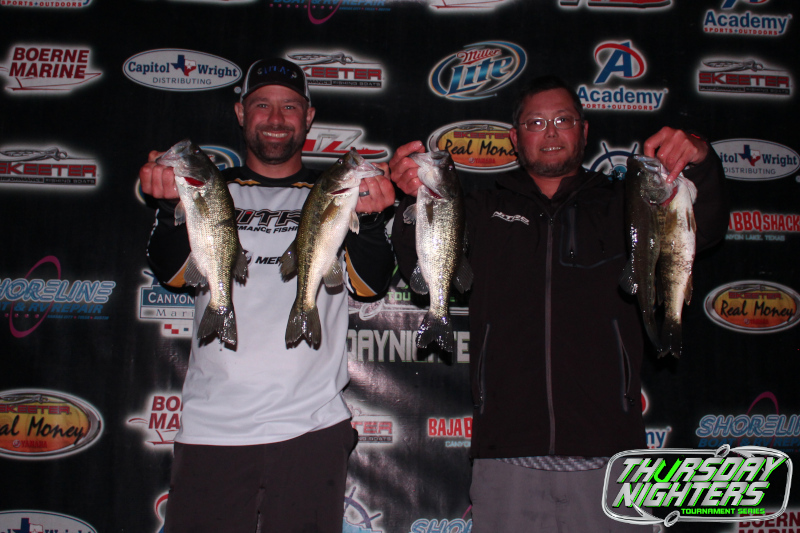 Jason & Joey targeted water with brush in the 5-10’ range and threw soft plastics but came up just a bit short of a limit and only weighed in 4 fish, but 4 good enough to earn them $500 and keep them atop the AOY Standings. A little wind, and a little cloud clover were likely the key contributors to the bounce back in weights this week. Canyon is as clear as it has ever been according to most, and without the wind or clouds to get fish moving and make it harder to be seen fishing is tough. Here it is mid-April and fish are still being caught off beds from mid-lake to the dam. 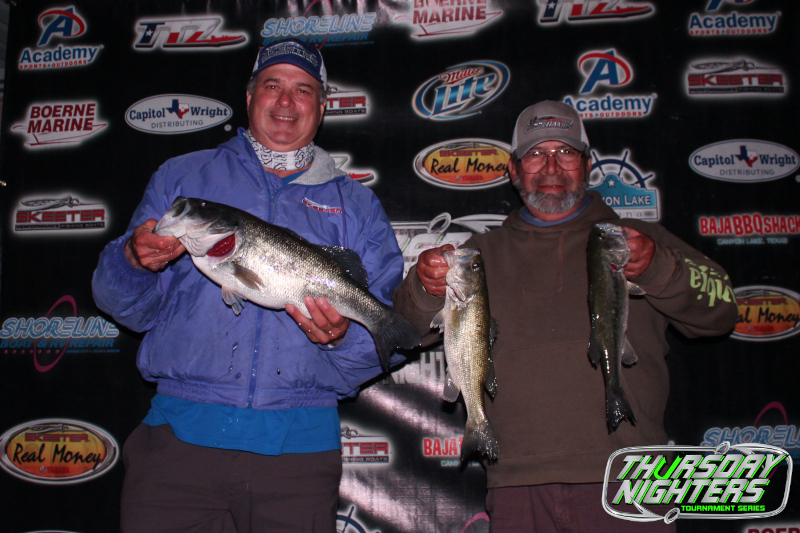 Light line and small baits have been crucial for anglers when the bite has been tough, but this week many anglers caught fish on moving baits including the Big Bass of 7.24 pounds brought in by Corey Schnautz and Raymond Calk. 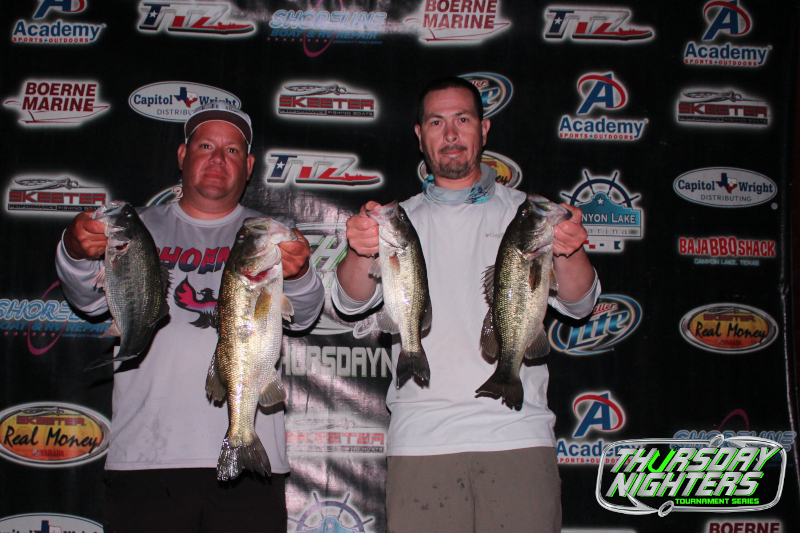 Corey and Raymond caught that big fish on a swimbait in 10-12’ of water just before dark. 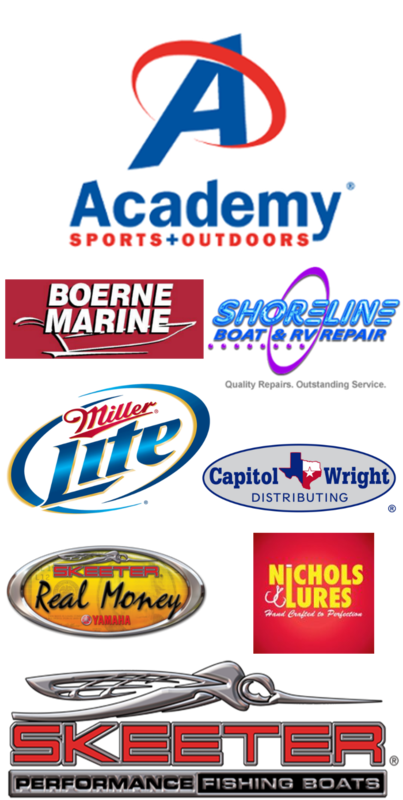 Registration opens at 6:00pm on the dock of Canyon Lake Marina Anglers are not allowed use of the ramp at Canyon Lake Marina for the 2018 season, due to construction. © 2013 - 2019 Copyright - THURSDAY NIGHTERS - All Rights reserved.